The president of the Greek Community of Melbourne (GCM), Bill Papastergiadis, during his recent visit to Athens, delivered a speech at a meeting of the Special Permanent Committee on Greeks Abroad of the Greek Parliament and met with Ministers Panagiotis Kouroumblis, Eukleidis Tsakalotos and Th. Pelegrinis. 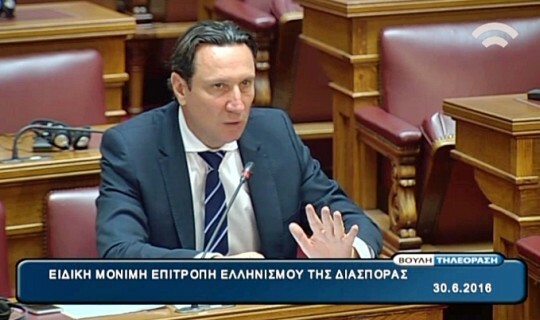 In his speech at the parliament, on Thursday 30 June, Mr. Papastergiadis spoke about the GCM and its activities, but also on issues concerning the Diaspora. "Judging from what we are discussing here at the meeting today I can say with certainty that the GCM is the most active organisation of the Diaspora," Bill Papastergiadis said. It must be noted that all the participants were impressed by GCM’s work and activities. "Our community today - having a very capable Board - is planning and completing important projects and programs, promoting our language and culture, not only to the Greek-Australians, but also to the Australians," he said. "And in order to achieve our aims we are having constructive and harmonious cooperation with all the Greek organizations, our Church, the political parties and the respective governments of Australia, and Greece." Furthemore Mr Papastergiadis met with ministersÂ Panagiotis Kouroumblis, Eukleidis Tsakalotos and Th. Pelegrinis.